When this unusual c.1907 farm implement catalog for McWhorter Mfg. Co. in Riverton, NJ with a purple cover and green text surfaced on eBay I bid for it even though I had no clue where such a factory would have stood. …another ad for a grass edger made by Allen McWhorter (presumably a son or other relative) indicating a 420 Lippincott address. However, both of those residential neighborhood addresses seemed like an unlikely place for a manufacturer of farm and garden implements. While I was stumped on the location, Roger kept digging and found the plant in East Riverton, as shown on Sheet 14 of this 1919 Sanborn Insurance Map for Riverton. HSR Board member Roger Prichard saw this eBay auction for a scrapbook compiled by Jane Hovey Allen Boyer (1875-1940), a former Riverton resident. Boyer was a book illustrator, prize-winning artist, and served twice as Porch Club president (1921). She and her husband Murray C. Boyer lived for decades at 304 8th Street and played active roles in Riverton’s social and civic life. Despite earning a reputation as a children’s book illustrator and teaching art classes at the Porch Club, her 1940 obituary makes no mention of her artistic achievements. I think Roger is concerned that some ancestor might wish to get this scrapbook because there are many family photos and genealogical information in it. I suspect that the Easthampton, MA-based eBay seller obtained it from an estate sale or home cleanout. I doubt any living descendant would discard such a unique record noting births, marriages, and deaths in a family tree going back to the 1600s. Perhaps the family line just played out and there is no one left to tend to memories of the family. What is kind of incredible is that Jane Allen Boyer is not just some obscure and forgotten artist, but her works still enjoy an audience almost eighty years after her passing. The Internet Archive has several books she illustrated available for viewing. Jane Eayre Fryer authored a series of Mary Frances books for children during the early 1900s, and Jane Allen Boyer illustrated most of them. A facsimile reprint of The Mary Frances Sewing Book (1913 Edition) is preserved on Open Library. Incredibly, a 100th Anniversary Edition Story-Instruction Sewing Book with Doll Clothes Patterns for American Girl and Other 18-inch Dolls is available for sale on Amazon over a century since its original publication. The Quaker Boy on the Farm and at School, also available on the Internet Archive, published in 1908, looks at the social life, customs, and education experienced by a typical young member of the Society of Friends in the 19th century. Mary Frances Knitting and Crocheting Book, in several formats, including a free Kindle version. Walmart today sells poster-size prints of one of Boyer’s illustrations for The Mary Frances Cook Book. Etsy sellers get in on the renewed interest in the use of Jane Allen Boyer’s vintage images as digital clipart. The genesis for the formation of the Riverton Free Library Association originated at a meeting in January 1899, called for by the rector of Christ Church, Rev. R. Bowden Shepherd, for the purpose of forming a free library for local residents. Within months, a group formally organized, adopted a constitution and bylaws, chose a board, elected officers, and opened in May 1899, in the Parish House with 800 books donated by Christ Church. The permanent home at 306 Main Street came in 1908, a gift from Mrs. Sarah Ogden in memory of her husband, Edward H. Ogden. 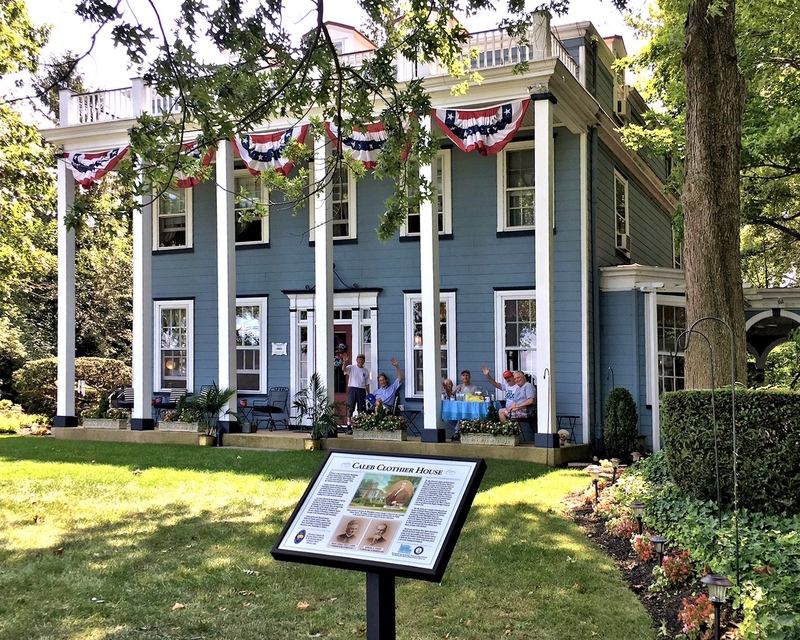 Riverton Free Library, now housed in the Victorian cottage on Main Street, has survived and flourished for more than a century due to the devotion of scores of people who have acted as its stewards, including board members, officers and staff, volunteers, and supporters. In researching to prepare for a historical marker commemorating the landmark, Patricia Solin and Roger Prichard have written a feature article for the January 2018 Gaslight News chronicling the history of the RFLA and the building that now serves as its home. I revisited the building last week and met with Nancy Fort, the new Director. After getting a fresh exterior paint scheme last fall, workers had turned to paint the Library’s altered interior. The spirited conversation of adult card players enjoying a game filtered in from the next room. Nancy Fort placed this antique wooden box on an old round oak table displaying the worn patina of decades of use. I had to wonder. What changes – not only to the building but also in its operation – had it witnessed over the years?